It took us 30 minutes to get there, driving very leisurely and not taking the most direct route. If you live in Tempe or Scottsdale, Fountain Hills is practically (or literally) your neighbor! That's right. It only costs you time and gas to get there. It's a beautiful place, completely free to see. 3. It is extremely kid-friendly! It's really good without kids, and potentially even better with them. I'll explain why in a bit. Ryan forgot his camera at home this trip so we'll have to tell our review through the lens of my instagram story, haha! Though we did not have a set time to leave, we were aiming for when the girls (and Ryan) awoke from their nap. I forget what happened now, but we were all in the car and loaded up but Ry was still inside. I snapped this pic of Adelaide because it perfectly described my emotions while trying to have patience. The car ride was fun. We talked a lot, mainly about Ryan's upcoming short film he is creating. We also talked a bit about the girls' first birthday and our plans for a gift for them. I had a great time occasionally shifting my eyes to the girls and getting some laughs from them. They were troopers for the car ride. When we got there, we were immediately met by this amazing view. The whole town of Fountain Hills has a feeling like you're on a vacation getaway. Palm trees line the streets. Golf courses surround you at every turn. The park is even more gorgeous. The main view is of a lake which in the middle has a huge fountain which goes off every hour on the hour and is quite entertaining. We quickly realized we were both starving. Luckily, the park has some upscale cafes and pizzerias with patios (in the shade) that let you still enjoy the beauty of the park. We chose to have a meal at Euro Pizza Cafe. I had the California Chicken Club Sandwich. It was sooooo good. The girls each had a lemon and finally got enough juice to have a real reaction. The girls were very well-behaved and made friends with all the nearby patrons. Clairvaux danced for all of them and Adelaide waved to some of them. After lunch, we took a quick leisurely stroll. You can follow a path around the whole lake that could probably be upwards of half an hour. 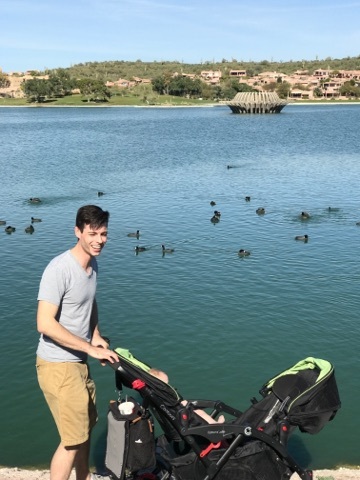 We didn't go the whole way because the girls weren't feeling their stroller. So we opted to go to the playground instead. Fountain Park has two huge play areas. The first is a splash pad and water park that opens for the summer starting in April. The second is a playground separated into three sections: a playground for bigger kids on the left, a playground for little kids on the right, and a musical area in the middle. We took C & A down the slides a couple times and then headed over to the music area. Ryan liked it the most. C & A loved watching him play all the different xylophones they had. Lastly, we went over towards the lake and fed the ducks. I wanted to sit on the grass and just hang out. But Ry said "I want to show them the duckies!" and took them each individually over to the water. I love how he always thinks of what might interest them. He is such a great hands-on dad. When it was time to leave, neither of us wanted to go. Ryan made me promise we would return and we will. But probably on a cooler day. It wasn't bad for us but prolonged time in the sun is not a great thing for babies. C & A slept the whole car ride home.